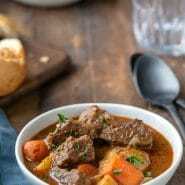 Best easy beef stew recipe! 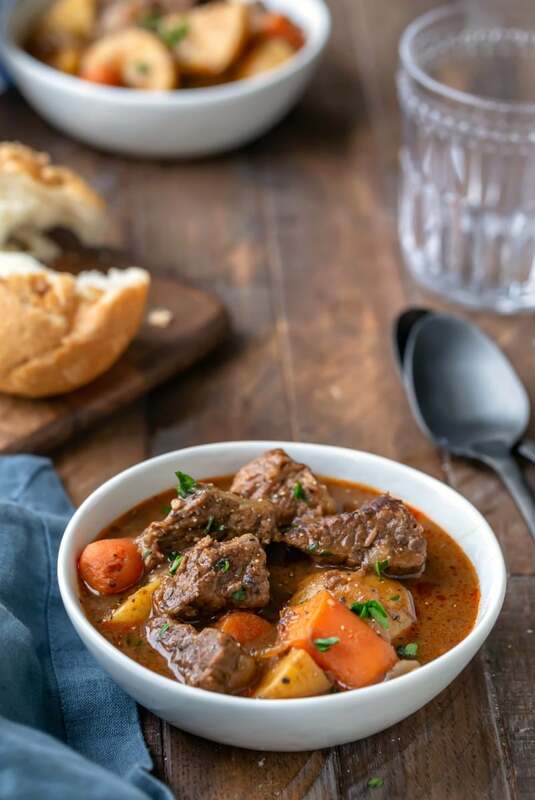 This homemade beef stew has meltingly tender pieces of beef chuck roast, carrots, and potato in a rich broth. 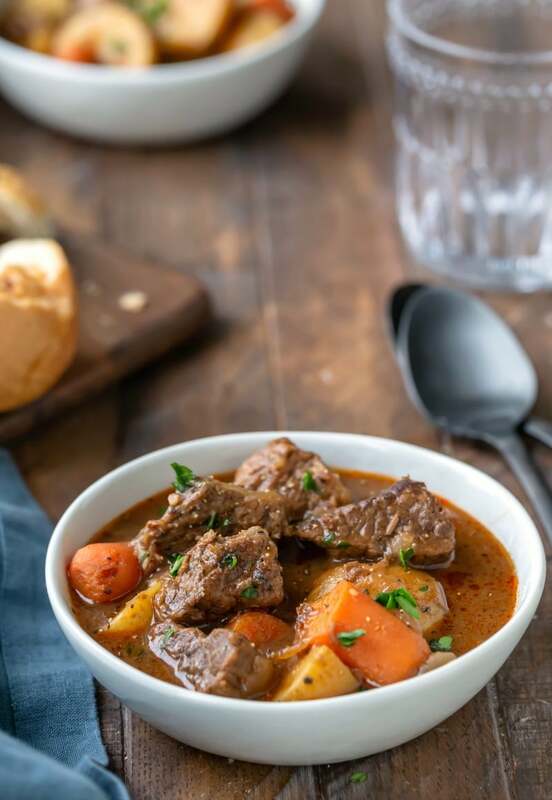 Growing up, beef stew was one of my favorite cold-weather dinners. The tender chunks of beef, soft carrots and potato, and rich broth are pretty much the perfect winter comfort food. There are a few ways to make beef stew. It can be made on the stove, in a crock pot (or Instant Pot), or in the oven. This recipe is an oven-braised beef stew. The great thing about making the stew this way is that you can get it going and then walk away from it while it bakes. Also, braising it in the oven allows the broth to cook down and really makes it rich and flavorful. This beef stew starts with browning the beef. This helps to develop the flavor of the beef before it’s braised. Then, the aromatics are sauteed to build a flavorful base for the broth. Then, it’s braised in the oven for two hours, and then the carrots and potatoes are added in. The stew is then braised for an additional hour. I just microwave it to reheat it. One of the great things about this recipe is that it tastes as good or better the next day. A loaf of crusty no-knead bread is perfect alongside this stew. My 30 Minute Garlic Knots are are delicious with this stew. 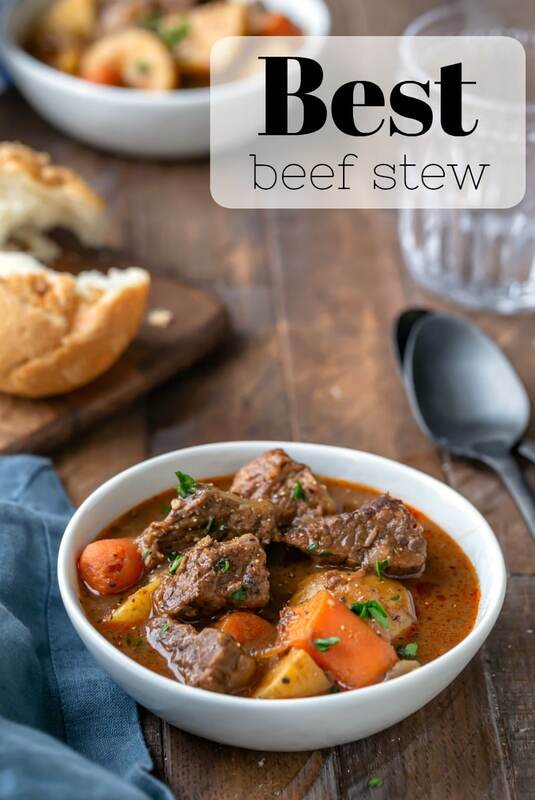 If you’ve tried this homemade beef stew recipe, don’t forget to rate the recipe and leave me a comment below. I love to hear from people who’ve made my recipes! You can SUBSCRIBE to receive my latest recipe newsletters or FOLLOW ME on FACEBOOK, INSTAGRAM and PINTEREST for even more delicious food. Preheat the oven to 325F and set a rack in the lower middle position. Pat the beef dry and season with 1 teaspoon of the salt and pepper. In a large Dutch oven, heat 1 tablespoon of the olive oil over medium-high heat. Add the remaining tablespoon oil to the now-empty pot. Add the onions and garlic, and sautee for 3-4 minutes, stirring regularly. Stir in the balsamic vinegar and tomato paste; cook, stirring regularly, for about 1-2 minutes. Add the flour, rosemary, and thyme, and cook for 1-2 minutes, stirring regularly. Return the beef and its juices back to the pot. Add the beef broth, water, and bay leaves, and stir to combine. Cover, and bake in the preheated oven for 2 hours. Carefully remove the pot from the oven, and add the carrots and potatoes. Cover, and return to the oven for 1 hour more, or until the vegetables are cooked, the broth is thickened, and the meat is tender. Sprinkle with parsley, if desired, before serving. *A roast with good marbling is best. If you'd like to see an example of good marbling, check out the picture above the step-by-step photos above the recipe. **You won't want to crowd the pot. If the meat doesn't have enough room, it will steam and won't want to brown. Wonderful recipe! This is the best beef stew recipe I’ve ever made. The beef melted in our mouthes! Thank you for the recipe. It’s a keeper.